To enhance and improve health and safety outcomes through leadership, education and research by providing exceptional, culturally competent, holistic nursing services to all people. FEDERAL PUBLIC HEALTH SERVICE NURSES demonstrate commitment to excellence as a catalyst in the development and application of evidence based practice, leadership in preparedness, and providing compassionate care to our diverse multi-national community with integrity and professionalism. Acting with conviction and courage in adherence to the highest standards of ethical and moral principles in the promotion of wellness and disease prevention. 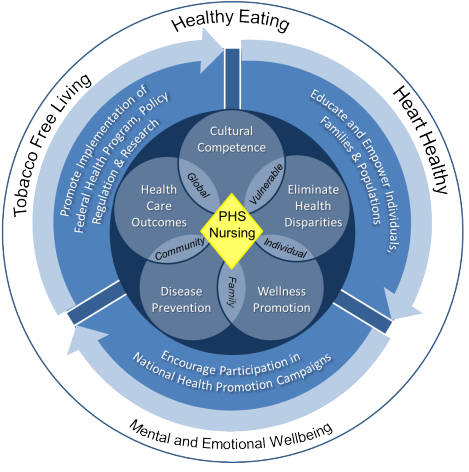 The themes illustrated in this model are a mirrored reflection of how the FPHSN community is committed to address health outcomes and eliminate health disparities for all people by the delivery of exceptional culturally competent holistic nursing services. It is a visual model to illustrate the vision, goals and objectives within FPHSN. This framework emphasizes the important role of nurses and far-reaching impact to its diverse populations. This team of nurses across every agency in HHS department, Tribal programs, and PHS Commissioned Corps Nurse officers assigned to Federal health programs in other Federal Departments can greatly influence the strategic impact areas and selected health initiatives. We recognize the diversity in populations and communities that we serve. Ensuring that prevention focused health care is integrated and individualized to a variety of settings, nurses are well equipped to eliminate health disparities for all people from the individual and family, to the underserved, vulnerable populations and global communities. Each selected health initiative reflects important health factors to be addressed across the life span and address a range of unique age groups to include but not limited to infants, children, children with special health care needs, adolescences and women. We believe there are 3 strategic impact areas that are necessary for FPHSN to reach their goals wherein nurses are best positioned to make an impact: educating and empowering individuals, families and populations; promoting the implementation of Federal Health programs, policy, and regulation and research activities; and encouraging participation in National Health Promotion Campaigns. Each strategic impact area relates to each of the health initiatives and guides action steps to effectively improve health. The nurses identified a commitment to address health initiatives focusing on Cardiovascular Health, Obesity Reduction, Mental Health Support, and Tobacco Cessation. This FPHSN has the capacity to provide unique knowledge, tools and options needed to improve health and promote wellness in support of health topics addressed in the National Prevention Strategy. Each of the selected FPHSN health initiatives has identified priority goals, objectives, and measures. Through these selected health initiatives and strategic impact areas, individuals, families, and populations will gain a better understanding of how they may live a healthier lifestyle; moving from healthcare intervention to healthcare prevention.